this lil’ gourmet piggy scored one of the prized seats at Dry Creek Kitchen’s Gala Dinner featuring five renowned chefs pairing their best with their Pinot Best choices, and this lil’ nerd piggy went to one of the seminars so he could learn how to work with pork…. Whatever event you choose, or if you really want to pig-out and attend the whole weekend of tastings, dinners, demo’s and classes, you’d better reserve ASAP for Charlie Palmer Fourth Annual “Pigs & Pinot” Flavor Festival at Hotel Healdsburg. On Friday, March 20 and Saturday March 21, Palmer hosts the Fourth Annual Pigs & Pinot weekend held at his award-winning Hotel Healdsburg, located in idyllic Healdsburg. Join Charlie and his visiting celebrity chefs—Michael Mina (Michael Mina, San Francisco), Christopher Kostow (The Restaurant at Meadowood, Napa Valley) Philippe Rispoli of France, and Graham Brown (Cervena, New Zealand) —along with Master Sommeliers and fellow enthusiasts as they toast and taste their way to reveal the winner of the coveted Pinot Cup. Proceeds from Pigs & Pinot 2009 will benefit Share Our Strength® and The Healdsburg School. Friday evening’s festival kickoff is the lively Taste of Pigs & Pinot where guests sample over 50 highly-acclaimed Pinot Noir wines competing in the Pinot Cup competition, both from Sonoma County and around the world. Each bottling is paired with a variety of pork dishes, including homemade sausages, charcuterie, grilled pork, pates and other special creations from Chef Palmer and Dry Creek Kitchen Chef de Cuisine Les Goodman as well as the guest chefs. The winner and runner up of the Pinot Cup will be revealed during Friday night’s Taste. The Pinot Cup is a Pinot Noir competition where 50 hand-picked Pinot Noirs compete in an oenophile matchup to award the best of the best by a renowned judging panel including top wine media personalities and industry heavyweights: USA Today’s Wine Critic Jerry Shriver and San Francisco Chronicle’s Jon Bonne. In this cooking class and tasting, Chef Palmer—assisted by guest chef Rispoli—demonstrates how to bump up the flavor and texture of lean meats by adding a layering of pork, like game birds in prosciutto, smoked bacon, or pancetta. This seminar will be held in an intimate demonstration classroom at the Relish Culinary School located near Hotel Healdsburg. Prepare yourself for “16 Pinots, 4 Master Sommeliers, Only 1 Winner,” featuring Master Sommeliers Keith Goldston and Fred Dame along with Dry Creek Kitchen Wine Director Drew Hendricks, and Aureole Las Vegas Wine Director William Sherer. Each Master Sommelier enters the room with his personal selection of 4 Pinot Noirs from around the world and proceeds to “sell” his favorites in this lively head-to-head pitch contest, followed by a tasting in which the audience picks the winner. 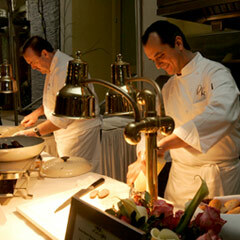 Saturday evening’s Pigs & Pinot Gala features a sumptuous five-course dinner at Hotel Healdsburg’s Dry Creek Kitchen. As a collaborative offering, each different course features a signature creation from Palmer and his guest chefs, paired with a limited-production pinot noir from wineries Craggy Range, William Selyem, Rancho Ontiveros Vineyards, Maison Shaps & Roucher-Sarrazin and Bien Nacido Vineyards. Pigs & Pinot Late Night is a late evening celebration following the gala with after-dinner drinks and dessert in the Hotel Healdsburg lobby. All Pigs & Pinot celebrants are welcome to attend. Hotel Healdsburg is offering two special guest packages during Pigs & Pinot weekend. Both packages include tickets to all events for two and exclusive access to the Pigs and Pinot Gala.